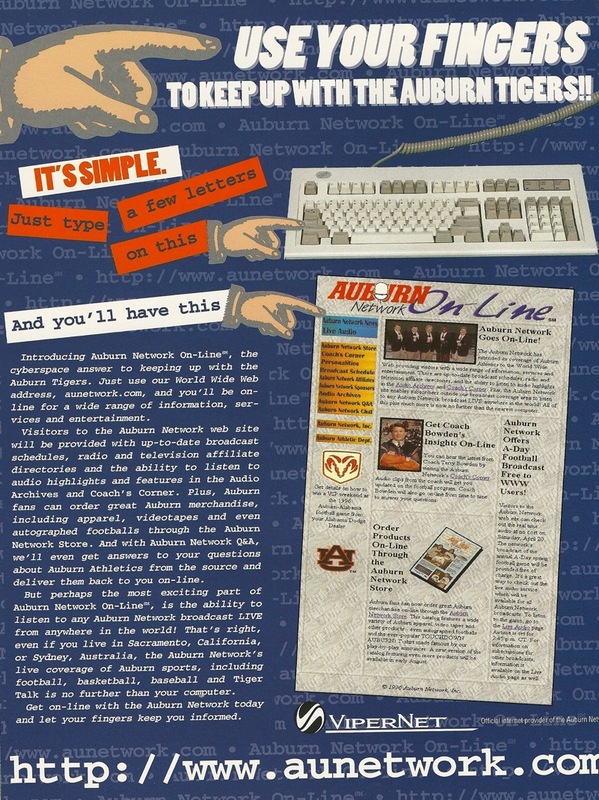 Auburn on the World Wide Web! Here’s a look back at the first set of wheels the Auburn Network took out on the Informationnnnnn Superrrrrrrr Hiiiiiiiighwayyy… circa Spring, 1996*. Click to enlarge. *As a rule, I rarely deem vintage any Auburncana produced after the Dye-era (arguments can be made for pieces produced in the 1993 season and up even to the ’94 Florida game, but I hate to see post-Attitude, Bowden-era Tiger-Eyes shirts listed as such), but the almost annual revolutions in internet technology demand separate standards for the emerging discipline of AUnline archivy. In other words, this ad might as well be the program for the ’59 Hardin-Simmons game. UPDATE: Strike that — this ad might as well be a picture of the program for the ’59 Hardin-Simmons, because THIS IS the program – with just a few nicks and scruffs around the links – for the ’59 Hardin-Simmons game. Thanks to Plainsman for reminding me that “everything can be found.” Good work. Started AU in fall ’96. I remember staying up all night hitting redial. I was halfway through my second year before I knew how to use my email. I graduated in 1994. We didn’t have student email. Patrick, you did have email. You, and most of the other 20000 people on campus just weren’t made aware of it. I found out just before graduation in May of 94 and used it to contact … well contact no one. I didn’t know anybody with an email address. By the time my masters rolled around in 99 it was in full use. Nice find Plainman. I wonder if Winn Dixie has any of those shirts left. I started that same quarter and remember registering by phone. funny thing was though no one told me that you had to register on the first night it opens for you as soon as possible. I walked into my adviser’s office in the middle of the week of freshmen registration and asked what I should sign up for. She looked at me like i was crazy. The winter schedule I had turned out to be the worst schedule of my college career, absolutely horrible. I knew one person with email, but learned to use it in parker hall on the Sun computers that had a different OS and got confused if I ever went to use it in Haley. ridiculous stuff.